If you haven’t tried slacklining, it’s time to find a line. These 1- to 2-inch wide strips of nylon webbing function a bit like a low-to-the-ground wobbly tightrope. It’s their wobble that makes them so challenging, requiring greater muscular engagement as you attempt to maintain your balance as you stand, walk or even perform tricks on the line. Even if you’re a balance master, don’t expect to be an automatic success with slacklining. The first time I gave it a try, my best attempt was just five steps… and I worked hard to get it done. The good news is that you don’t have to be an automatic success to enjoy the benefits of slacklining. The built-in balance challenge alone makes it an excellent way to activate multiple muscle groups, particularly the smaller stabilizing muscles of your hips and shoulders, as well as your core. 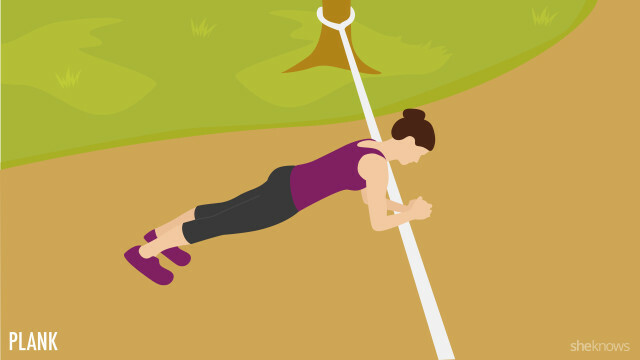 With this full-body strength training routine, you’ll use the slackline to create a balance challenge as you lie, press or step atop the line. 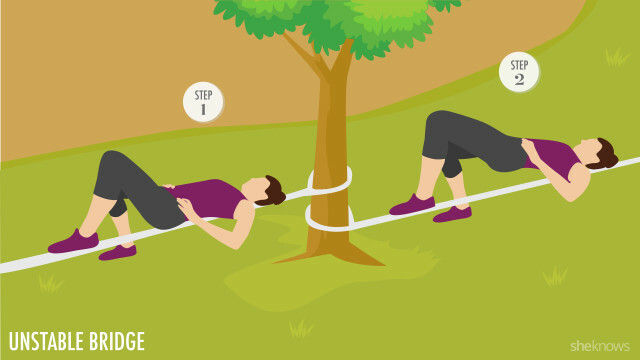 Although any slackline you have access to will work, Gibbon actually offers a FitnessLine that comes with comfortable hand grips so you don’t have to grasp the nylon during upper body exercises and a resistance band you can use to perform the exercises offered through their workout app. Perform this workout as a circuit, resting two minutes between each full round of exercises but with little to no rest between individual exercises. Perform each exercise for 30 seconds or 30 seconds per side for unilateral moves such as staggered and split squats, heel raises and side planks. Stand to one side of the slackline, feet slightly wider than hip-distance apart. Place the foot closest to the slackline on top of the line, toes aligned with the line. Keep your weight centered between your feet. Tighten your core, press your hips back and bend your knees to lower into a squat. Stop when your hips are just below 90 degrees, then press through your heels to return to standing. Remember to switch sides and repeat after your 30-second set before proceeding to the next exercise. Kneel on the ground behind the slackline, and grasp the nylon webbing so your hands are slightly wider than shoulder-width apart. Step your feet behind you into a full pushup position, your shoulders over your palms, legs fully extended. From this position, hop one leg forward, bending your knee as you draw it toward your chest, tapping the ball of your foot to the ground. Immediately switch the position of your legs, extending the bent knee and drawing your other leg forward. Stand about 1 to 2 feet in front of the slackline, facing away. Bend one knee, and place the top of your foot on top of the slackline so your feet are roughly hip-width apart. When you’re balanced, keep your core tight, and bend both knees, reaching your hands toward the ground. Make sure your front knee remains aligned with your toes without extending in front of your toes. When your fingers touch the ground on either side of your front leg, press through your front heel, and return to standing. Place your hands on the nylon webbing, slightly wider than shoulder-width apart. Step your legs behind you so your body forms a straight line from heels to head, your core tight, hips level. Make sure your shoulders are over your palms. Keeping your core engaged, bend your elbows, and lower your chest toward the slackline. When you’ve lowered yourself as far as you comfortably can, reverse the movement, and return to start. Stand to one side of the slackline, feet about hip-distance apart, maybe slightly closer together. 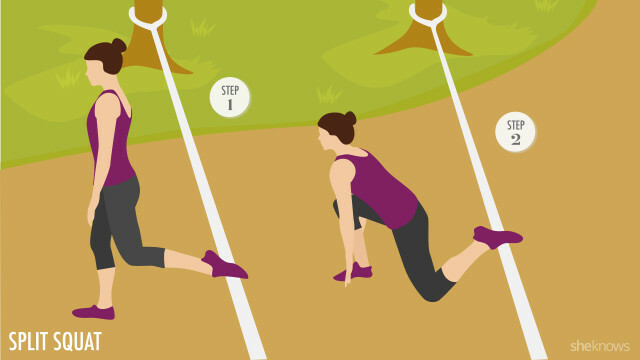 Engaging your core, lift the leg closest to the slackline, and reach it forward, placing it lightly on the slackline in a lunge-like position. Press your hips forward as you place more weight on your front foot, but don’t step all the way down. When you’re comfortably balanced, press through the ball of your front foot, and raise your heel a few inches. 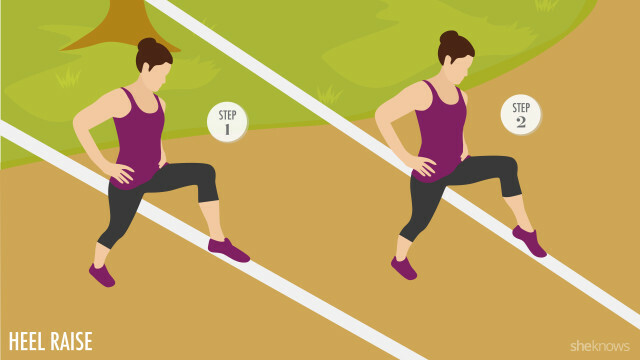 Hold for a count of one, then lower your heel back to the line. Sit straddling the slackline, knees bent, feet on the ground. 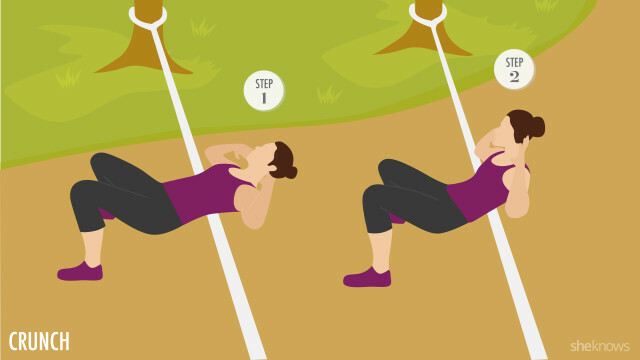 Carefully lean back, lying onto the slackline so it’s centered along your spine. Shift your weight slightly to the right, widening the position of your right leg for support. Place your left foot directly on the slackline, toes aligned with the line, knee bent. Press through both heels, and lift your hips, pressing them toward the sky. 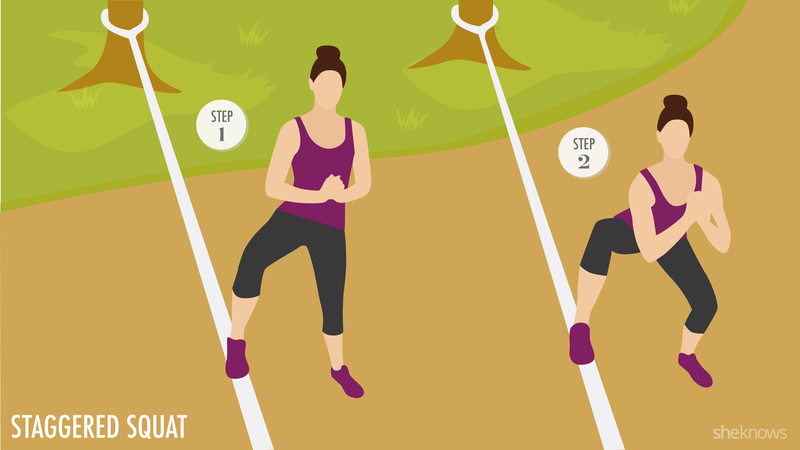 Hold for a count of one, then return your hips to the line and continue. 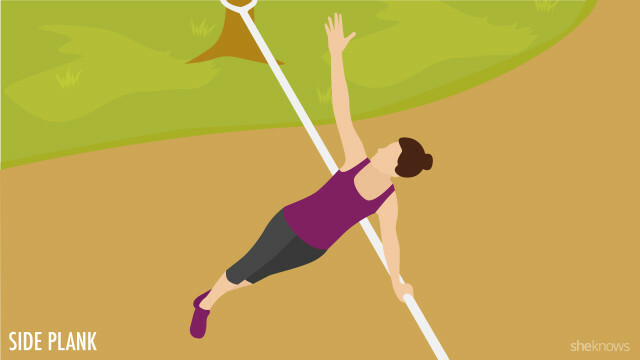 Kneel on the ground in front of the slackline, and place your forearms on the line. Step your feet behind you, extending them fully so your body forms a straight line from heels to head. Make sure your shoulders are over your elbows. Hold this position for the full 30 seconds, keeping your core tight and hips aligned between your shoulders and knees. 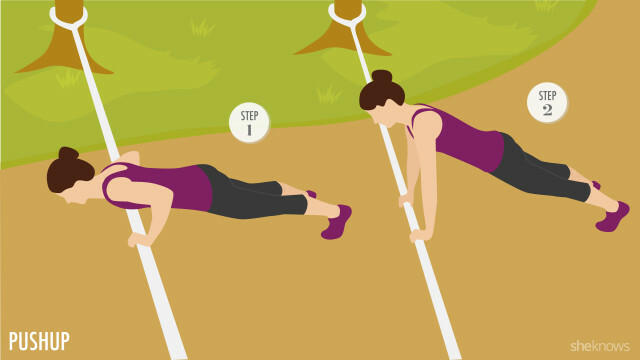 Start in a full pushup position on the slackline, your hands grasping the line beneath your shoulders and your legs fully extended. Twist your hips so your right hip starts rotating upward. As you twist, allow your feet to rotate so you’re balancing on their edges. When you’re ready, release your right hand, and reach it up toward the sky so you’re balancing with your left hand on the slackline and both feet on the ground. Your body should form a straight line from heels to head. Hold this position for the full 30 seconds. Sit on the slackline with your knees bent and both feet on the same side of the slackline. Grasp the slackline on either side of your hips for support. 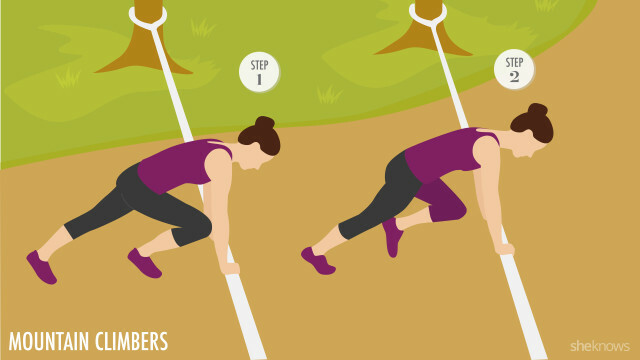 Press into the slackline, and lift your hips, walking your feet forward slightly before leaning back onto the line so it stretches across your midback. Lean back until your torso is parallel to the ground, and cross your arms over your chest, or place your hands to either side of your ears. Engage your core, and use your abs to pull your shoulders and head upward about 4 to 6 inches. Reverse the movement and continue.